CHONGQING, China -- Stand in the right spot in this gigantic city and hills draped with apartment complexes can remind you of Hong Kong, the density of habitation will recall Tokyo and the river-spanning brawn, replete with an immense new structure over the Yangtze that echoes the Brooklyn Bridge, might recall New York. A view of Chongqing Municipality in Southwest China. Everywhere one looks here, there are new expressways, new bridges and towering new housing complexes rising, so many in fact that it is the occasional glimpse of something old, rather than the sight of anything new, that takes one's breath away. China has built megacities before, of course. The country's rich east abounds with them, strung along the coast from Tianjin in the north to Shenzhen in the far south like so many pearls. But the swift rise of Chongqing represents a new departure: a major push by Beijing to spread the fruits of China's economic boom to the country's vast interior, home to three Chinese in four. A consensus has emerged among Beijing's leadership that the way to ease poverty in the interior is to encourage people by the tens of millions to abandon the land for the cities. "This is the path every developed country has taken," said Tang Jun, a sociologist at the Chinese Academy of Social Sciences. "To ask whether China wants urbanization is like asking whether a person needs to eat." In 1978, a mere 18 percent of Chinese lived in cities and towns. By 2010, the authorities estimate that 50 percent will, as part of what demographers and other experts say is the greatest migration in human history. One after another, the big cities of the interior have eagerly entered the race to urbanize, with many openly brandishing the objective of becoming a "world city" within a few years. But whether judged by its size, its ambition or the scale of transformation, Chongqing, with its 12 million people, remains in a class by itself. The city's economic growth is drawing about 200,000 new residents a year, the equivalent of adding an Akron, Ohio, or an Orlando, Fla. But the city fathers are not content to stop there. They are also expanding the city limits, rapidly incorporating adjacent rural areas under a scheme the city calls the "one-hour economy circle." Under the plan, which is being emulated by other big inland cities, the city wants to move two million rural residents into newly urbanized areas within an hour's driving distance from the city center within the next five years, and another two million in the five years after that. As an inducement the city is enticing landholders to surrender their claims on their rural plots in exchange for prized urban residency permits that offer not only legal residence in a city, but also access to social services and benefits unavailable in rural areas. 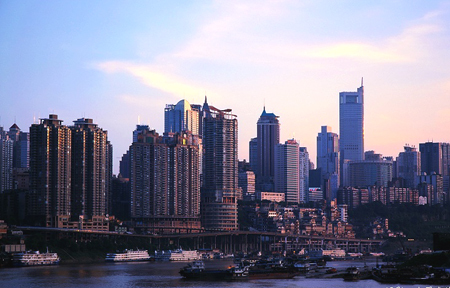 Chongqing is already comfortably China's biggest inland city, but within a decade or so, initiatives like these could push it into contention with Shanghai and Beijing for the title of the nation's biggest city. As with anything on this scale, the process has been full of hiccups, gigantic hiccups in some cases, all of which are on display almost every day here. One of the most obvious problems is the environment. Even in a country full of grimly polluted places, Chongqing, whose economy is based on river transportation, steel, smelting and the manufacture of motorcycles and automotive spare parts, bears special mention. A haze hangs in the air even on good days, and for much of the rest of the year the city's skyline simply disappears at any distance. Chongqing plans to move a giant steel mill that belches smoke night and day from the city center to the outskirts and has undertaken other measures to improve air quality, which residents say have begun to produce limited results. "For 10 days this winter you could see clear blue skies and white clouds, which is something that didn't exist in previous winters," said Wu Dengming, leader of a local environmental group called the Green Volunteer League. But asked about the future, given the rapid population growth, Mr. Wu sounded markedly more pessimistic. "There are more and more pressures on the environment, and the population is the main reason," he said. "More people means more consumption, more production and more waste." Increasingly the city's expansion is attracting people who might otherwise have migrated to the east or beyond. Yun Zhao, 31, a bright woman who works in a large insurance company here, was drawn back here after studying in Toronto and becoming a legal resident of Canada, something that has long been close to an irresistible dream for many Chinese. "I grew up in Chongqing, but now when I go to other districts to meet friends, I wouldn't recognize them as part of Chongqing unless someone told me," Ms. Yun said. Asked why she had decided to come back, she was categorical. "There are more opportunities here than abroad," she said. But if the creation of giant new cities like this was intended to alleviate the poverty of rural migrants, the results so far have been mixed. Many thousands of people arrive here chasing a dream they seem unlikely ever to catch. Those Chongqing newcomers can be seen in droves, trudging through the city's streets with lengths of stout bamboo looking for casual work as old-fashioned porters. Others are drawn by the lure of regular work in the booming construction industry, but the supply of laborers far outstrips the demand. Yu Hai, a 25-year-old man with the face of a teenager, arrived alone from his village in Sichuan Province in April, hoping to earn enough money to help his father, who is 70 but still farms the family's small plot of wheat, potatoes and rice. "My father is a hard worker," Mr. Yu said, speaking in a run-down neighborhood that is full of recent arrivals. "I tell him to have fun for a day, but he doesn't know how." "If I can find a good job, I'll stick to it," Mr. Yu continued, setting his goal at about $125 a month. "Why would I go home? It's too tedious to work the land."